Summer may be coming to a close, but it still has our heart along with this sweet baseball party. Going to baseball games is a huge deal for our family each summer and it's a love within our boys that runs deep. Living in the Chicago area it's only natural that we are big Cubs fans as well. When our son turned eight he automatically knew that he wanted a baseball party and he wanted it Cubs themed. And since our team took the championship last year it seems fitting to finally share all the details! 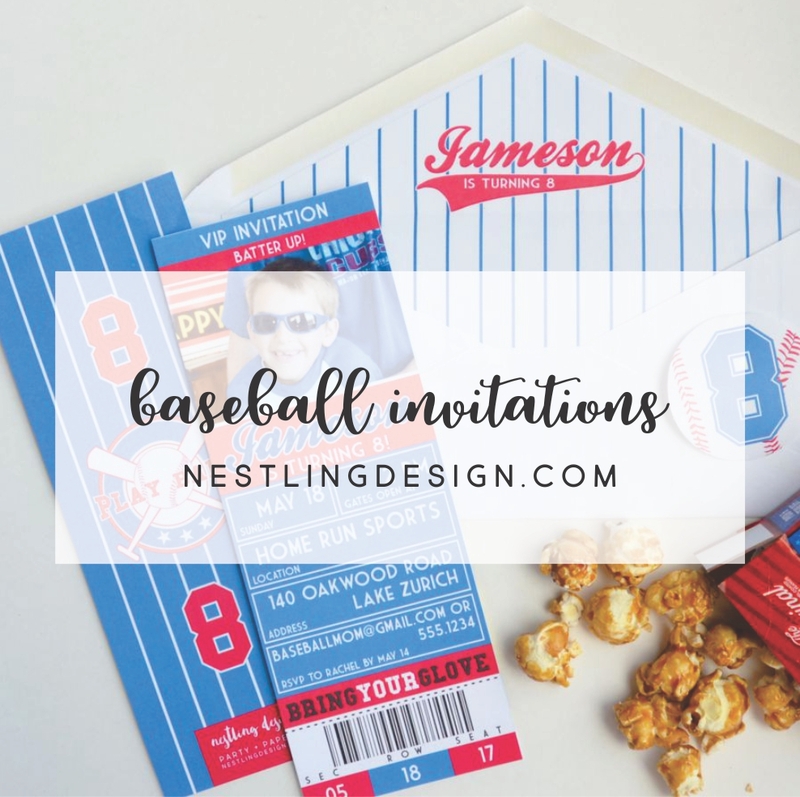 We designed cute baseball invitations to mimic actual tickets and they really set the stage for the whole vibe of the party. We held his party at a local sports center that had a whole program to keep the boys occupied and having fun playing some ball. Parties not held in our house are always super fun because I don't have to plan any activities, but are also a little trickier to decorate. My biggest tip when people ask how to decorate at a place that you aren't allowed to either hang things up or bring many items in is to have a large backdrop (preferably mounted to a board) that you can easily prop up against the wall. We were pretty spoiled in that my mother in law had cupcakes delivered to us from Georgetown Cupcake. Don't they just look dreamy?! (they were delicious as I'm sure you can imagine). For snacks we kept to the basics: popcorn, pretzels, and sweets. Serving the pretzels in this super cute cups were not only a hit with the crowd, but made a super cute favor. Let's face it: at the end of a party kids are only thinking of one thing - that party swag ;) We gave out baseball essentials in paper sacks with the intention that they could also bring home a few concession treats. That's a wrap! Tell us your favorite party in the comments!